I was upstairs in my “man cave” when I noticed something tiny flying around. This bug was tiny compared to a fruit fly which we sometimes find in the kitchen around the fruit. It was moving quite fast, so I didn’t get a good look at it, and it didn’t land as far as I could tell. In fact, it seemed very busy. And I started wondering. How could such a small creature have all the equipment and the know-how to fly? It seems impossible. 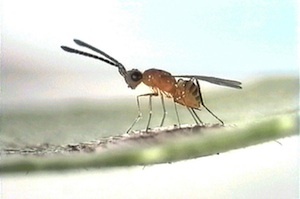 I looked on the web for the smallest flying insect, and the winner is the Fairfly (http://www.cals.ncsu.edu/course/ent425/text01/smallest.html). This fly is only 0.139 mm long. To compare, I got my micrometer, pulled out a hair from my beard (ouch!) and measured its width: 0.21 mm. Imagine! This fly could land and turn around on the hair without it overhanging the sides. So I say again, as in the title, it is too small to fly! But, obviously, it does. Imagine what it would take to build and make such a small flying object which would also be autonomous (self-governing). Not only is the physical makeup of this fly very complicated – just as complicated as a large wasp, I imagine; but to give it the mental ability to maneuver its body and decide where to fly to, how to land safely, and what chore to accomplish, is stretching the best engineers’ abilities today. I like the design argument to prove the existence of God…but we still have to understand the mechanism he (God) used to create matter and subsequently; life. Vengeance is mine. I will repay, says the Lord.